As we prepare for the opening of our new exhibition Texas! Making History Since 1519, we are dedicated to helping you learn more about the great Lone Star State. So today, Amanda Norris and Pat Dietrich, youth educators at the museum, write to you about David Crockett. Just in case you missed it, check out last week’s post on Stephen F. Austin. This Alamo defender was born in Tennessee on August 17, 1786. Crockett spent the early part of his life in several small towns in Tennessee, helping his father at the family owned tavern. At the age of 20, he married Polly Finley and later moved with his family to a farm near the border of Alabama. In September of 1813, Crockett joined the local militia to avenge an Indian attack in nearby Alabama. He reenlisted in 1814. When he returned from service in Pensacola in 1815, is wife became ill and passed away. He remarried a few months later and traveled to Alabama to look for land for his family. However, he returned to Tennessee and decided to live there. He became a Justice of the Peace, but then resigned to become a town commissioner. During the next 13 years, Crockett served terms in the Tennessee legislature, returned to private practice, served two terms in the United State House of Representatives, but was defeated in 1835. By this time he was nationally known as a storyteller, sharpshooter and hunter. Several books were published relating his tall tales. 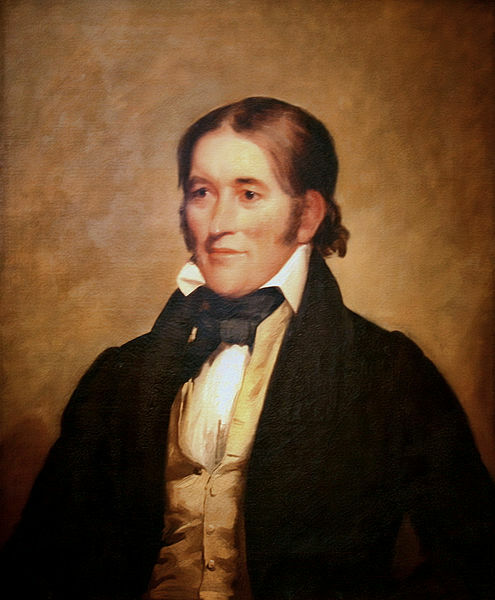 In February of 1836, David Crockett arrived in San Antonio de Bexar. Sam Houston had ordered that his army retreat from the Alamo, but Colonel William B. Travis disregarded the order. Crockett sided with Travis, ready for a good fight. Mexican Army General Antonio Lopez de Santa Anna had arrived at San Antonio on February 20, ready to seize the Alamo. 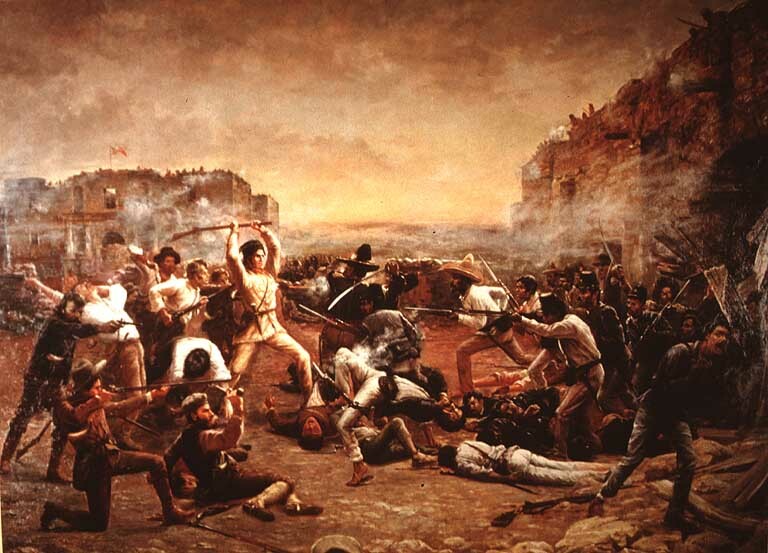 With no reinforcements arriving, the thirteen day siege of the Alamo ended on March 6, 1836. In less than two hours, David Crockett, Jim Bowie, William B. Travis and between 185 and 255 other defenders lost their lives. “Remember the Alamo” and “Remember Goliad” became the battle cry at the successful Battle of San Jacinto on April 21, 1836, when Sam Houston’s army defeated Santa Anna in a savage 18-minute battle. Davy Crockett’s life has been depicted in Hollywood for decades, a topic ripe for the silver screen. There have been several movies about the famous Alamo battle in two of these, the character of Davy Crockett has been played by the likes of John Wayne and Billy Bob Thornton. In the famous 1955 Walt Disney series Davy Crockett, King of the Wild Frontier, the title character of Davy Crockett was played by Fess Parker. Davy Crockett’s efforts to free Texas from Mexico have made him a Texas Legend admired by historians and school children alike! Learn even more about Texas in our new exhibition, opening to the public on March 6, 2011. Get a sneak peak at the exhibition during our Texas VIP Nite, March 2 from 6 to 8 p.m. And stay tuned to the blog as we highlight other important people and events throughout the run of the show. After retiring from 32 years of teaching, Pat came to HMNS. She is able to share all the great educational opportunities there are for educators and students at our museum. She teachers the Gifted and Talented differentiation classes, and loves getting to see how excited people are when they walk into the Museum’s Grand Hall. In her spare time, she loves to read and be with her family.